In this tutorial, we will look at how to align cells in Excel as well as how to change text orientation, justify and distribute text horizontally or vertically, align a column of numbers by decimal point or specific character. By default, Microsoft Excel aligns numbers to the bottom-right of cells and text to the bottom-left. However, you can easily change the default alignment by using the ribbon, keyboard shortcuts, Format Cells dialog or by setting your own custom number format. Top Align - aligns the contents to the top of the cell. Middle Align - centers the contents between the top and bottom of the cell. Bottom Align - aligns the contents to the bottom of the cell (the default one). Please note that changing vertical alignment does not have any visual effect unless you increase the row height. 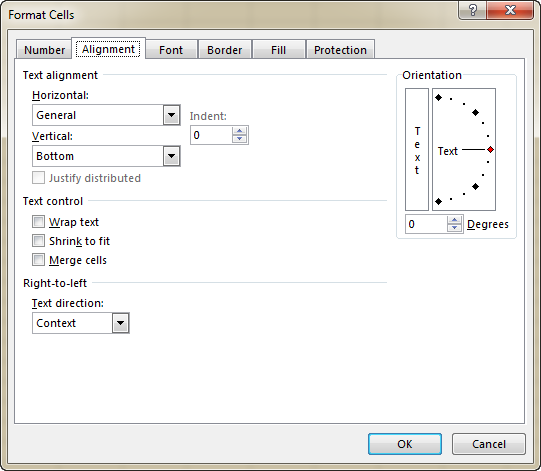 Align Left - aligns the contents along the left edge of the cell. Center - puts the contents in the middle of the cell. Align Right - aligns the contents along the right edge of the cell. In Microsoft Excel, the Tab key does not indent text in a cell like it does, say, in Microsoft Word; it just moves the pointer to the next cell. To change the indentation of the cell contents, use the Indent icons that reside right underneath the Orientation button. To move text further to the right, click the Increase Indent icon. If you have gone too far right, click the Decrease Indent icon to move the text back to the left. At first sight, it looks like a lot of keys to remember, but upon a closer look the logic becomes obvious. The first key combination (Alt + H) activates the Home tab. In the second key combination, the first letter is always "A" that stands for "alignment", and the other letter denotes the direction, e.g. A + T - "align top", A + L - "align left", A + C - "center alignment", and so on. Now, let's take a closer look at the most important ones. Apart from aligning text horizontally and vertically in cells, these options allow you to justify and distribute the cell contents as well as fill an entire cell with the current data. Like Justify, the Distributed option wraps text and "distributes" the cell contents evenly across the width or height of the cell, depending on whether you enabled Distributed horizontal or Distributed vertical alignment, respectively. Unlike Justify, Distributed works for all lines, including the last line of the wrapped text. Even if a cell contains short text, it will be spaced-out to fit the column width (if distributed horizontally) or the row height (if distributed vertically). When a cell contains just one item (text or number without in-between spaces), it will be centered in the cell. When changing the Horizontal alignment to Distributed, you can set the Indent value, telling Excel how many indent spaces you want to have after the left border and before the right border. If you don't want any indent spaces, you can check the Justify Distributed box at the bottom of the Text alignment section, which ensures that there are no spaces between the text and cell borders (the same as keeping the Indent value to 0). If Indent is set to some value other than zero, the Justify Distributed option is disabled (grayed out). Usually, justified and/or distributed text looks better in wider columns. Both Justify and Distributed alignments enable wrapping text In the Format Cells dialog, the Wrap text box will be left unchecked, but the Wrap Text button on the ribbon will be toggled on. As is the case with text wrapping, sometimes you may need to double click the boundary of the row heading to force the row to resize properly. 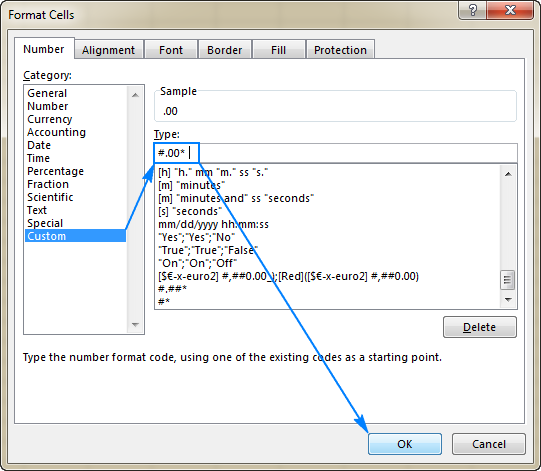 Exactly as its name suggests, this option centers the contents of the left-most cell across the selected cells. Visually, the result is indistinguishable from merging cells, except that the cells are not really merged. This may help you present the information in a better way and avoid undesirable side-effects of merged cells. These options control how your Excel data is presented in a cell. Wrap text - if the text in a cell is larger than the column width, enable this feature to display the contents in several lines. 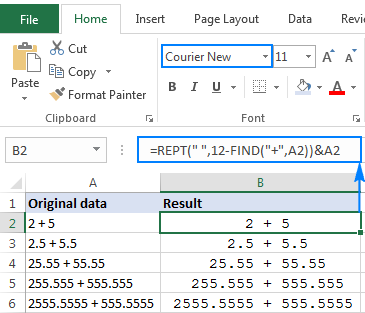 For more information, please see How to wrap text in Excel. Shrink to fit - reduces the font size so that the text fits into a cell without wrapping. The more text there is in a cell, the smaller it will appear. Merge cells - combines selected cells into one cell. For more information, please see How to merge cells in Excel without losing data. The following screenshots show all text control options in action. The text orientation options available on the ribbon only allow to make text vertical, rotate text up and down to 90 degrees and turn text sideways to 45 degrees. The Orientation option in the Format Cells dialog box enables you to rotate text at any angle, clockwise or counterclockwise. 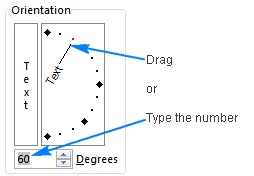 Simply type the desired number from 90 to -90 in the Degrees box or drag the orientation pointer. The bottom-most section of the Alignment tab, named Right-to-left, controls the text reading order. The default setting is Context, but you can change it to Right-to-Left or Left-to-Right. In this context, "right-to-left" refers to any language that is written from right to left, for example Arabic. If you don't have a right-to-left Office language version installed, then you will need to install an appropriate language pack. For starters, it should be noted that the Excel number format is not explicitly designed for setting cell alignment. However, it allows "hardcoding" alignment for certain cells to ensure that your data looks exactly the way you want, regardless of the alignment options enabled on the ribbon. Please note, this method requires at least some basic knowledge of format codes, which are explained in detail in this tutorial: Custom Excel number format. Below I will demonstrate the general technique. To set cell alignment with a custom number format, use the repeat characters syntax, which is nothing else but the asterisk (*) followed by the character you want to repeat, the space character in this case. For example, to get numbers to align left in cells, take a regular format code that displays 2 decimal places #.00, and type an asterisk and a space at the end. As the result, you get this format: "#.00* " (double quotes are used only to show that an asterisk is followed by a space character, you don't want them in a real format code). If you want to display a thousand separator, use this custom format: "#,###* "
Select a cell(s) that you want to format. Now that you know the essentials of Excel alignment, let me show you a couple of tips to enhance the visual presentation of your data. To align numbers in a column by decimal point, create a custom number format as explained in the above example. But this time, you will be using the "?" placeholder that leaves a space for insignificant zeros but does not display them. 0.?? - shows one insignificant zero to the left of the decimal point. 0.0? - shows one insignificant zero on both sides of the decimal point. This format is best to be used if your column contains both integers and decimals (please see the screenshot below). In the above format codes, the number of question marks to the right of the decimal point indicates how many decimal places you want to show. For instance, to display 3 decimal places, use #.??? or 0.??? or 0.0?? format. If you want to align numbers to the left in cells and have the decimal points align, click the Align Left icon on the ribbon, and then apply a custom format similar to this: _-???0.0?;-???0.0? Semicolon (;) divides the format for positive numbers and zeros from the format for negative numbers. Underscore (_) inserts a whitespace equal to the width of a minus (-) character. The number of placeholders to the right of the decimal point determines the maximum number of decimal places to be displayed (2 in the above format). A question mark (?) to the left of the decimal point takes up a space equal to the width of one digit, if a digit is not present. So, the above format code will work for numbers that have up to 3 digits in the integer part. If you are dealing with bigger numbers, you will have to add more "?" placeholders. In situations when the capabilities of Excel alignment may not be sufficient to replicate a certain data layout, Excel formulas may work a treat. To makes things easier to understand, let's consider the following example. Solution: Create a helper column with the following formula, and then apply a monotype font like "Courier New" or "Lucida Sans Typewriter" to the helper column. cell - a cell containing the original string. char - a character you want to align by. n - the maximal number of characters before the aligning character, plus 1. How this formula works: In essence, the formula adds leading spaces to the original string by repeating the space character, and then concatenates those spaces with the string. The number of spaces is calculated by subtracting the position of the aligning character from the maximum number of characters preceding it. This is how you change cell alignment in Excel. I thank you for reading and hope to see you on our blog next week. 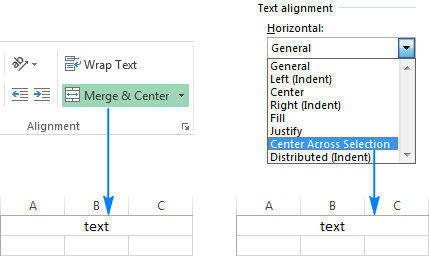 9 Responses to "How to align text in Excel"
Shouldn't that be align ? Definitely, it should. Don't know how these silly typos sneak in :) Thank you, Eric! Many thanks for this very good work! This doesn't handle cases where some numbers have negative sign in front. Can that be aligned as well? Maybe you can help me with this? I'm trying to figure out how to bottom align my field of text in an Excel spreadsheet 2013 and 2016 when there's a lot of text in the field. I'm using the spreadsheet as a tracker type document to track events, etc. And I have the field bottom aligned but when I look at the spreadsheet the fields do not align the text to the bottom. Instead, I have to double click on the field to "activate" it which then allows me to see the entire journal description and all the entries. During the input process, I am clicking ALT-ENTER to skip down a line to enter a new journal entry. ie. I'm having an issue. I need to underline a few words in a cell that is wrapped text and justified. I only need to underline a few words and not the whole paragraph. When i do it the underlines are broken and not a solid underline. In the task bar it looks solid but when you click out of the cell the line breaks. I can not find an answer anywhere! I need to do this several times a day in very important financial documents. Please help me! What is the point of hiding the text on the left of the screen with the stupid sharing bar? I can't read the page as this is hiding or overwriting the text! hi! whenver i try conditional formatting the data automatically moved to left indent. here's what happen, i use data validation list for Yes, No. Data is centered after checking. when i add conditional formatting - highlight cell rules - equal to - YES with (tried all the colors). when i checked, and chose Yes it automatically moved to left. i already double checked the alignment, merge center, wrap text and format cells- alignment all of which are centered, but data is fixed on the left. i already reboot the pc and i'm using MS Office 2010. how can i fix this? thanks!